December 2, 2012 by Anthony Palombo, D.C. 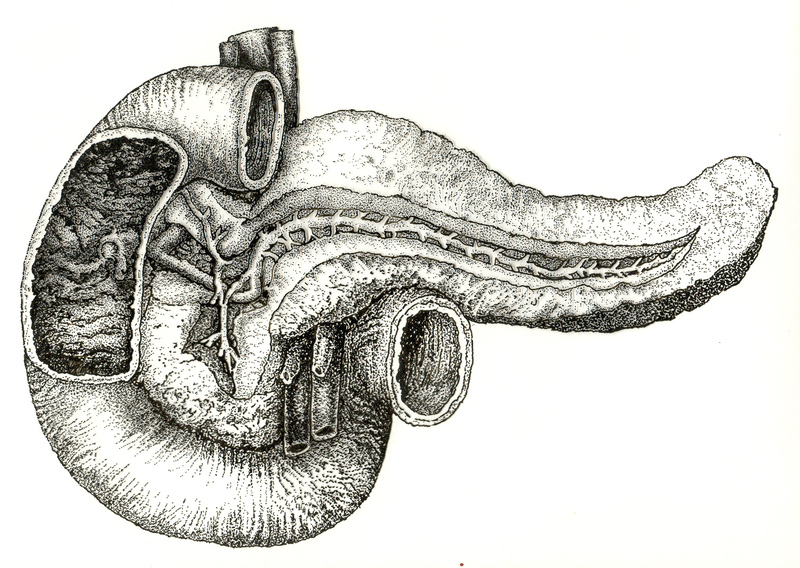 The pancreas, depicted here embracing and being embraced by the duodenum, the first twelve inches of the small intestines, offers an enormous blessing in the body temple. That blessing is twofold: as an organ of the digestive system and as a hormone gland of the endocrine system. Most of the body of the pancreas serves as an organ and is taken up in the production of enzymes and alkaline rich digestive juices that are used in the process of digesting the foods we consume. Pancreatic enzymes help break down proteins into amino acids, the building blocks of tissues, and start the process of converting carbohydrates into simple sugar for energy. 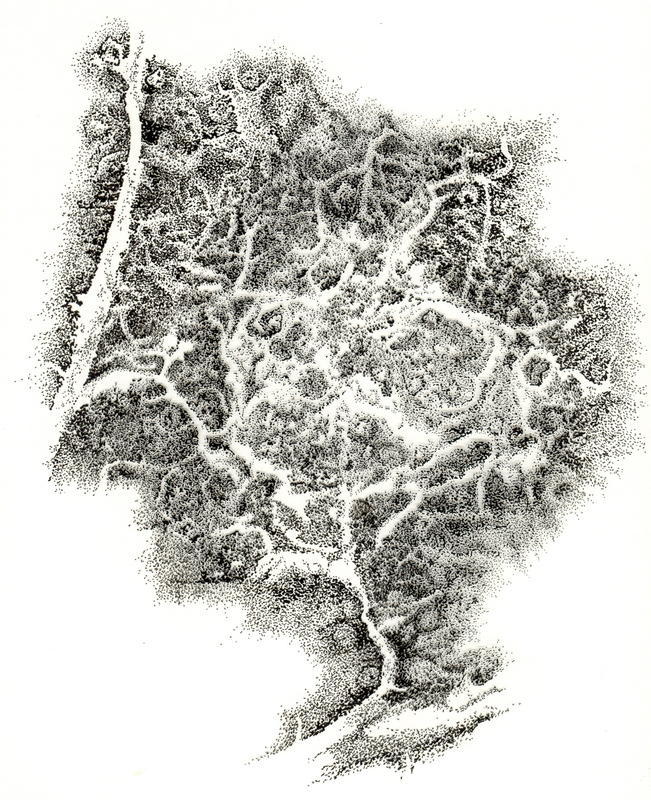 Embedded in its spongy tissues are tiny glands that produce insulin, among other chemistry. They are called islets of Langerhans after the young scientist who discovered them, Paul Langerhans. Insulin is a hormone produced by Beta cells in the islets. It escorts sugar to the cells as fuel for energy. It “parks” on a designated cell receptor site and delivers its sweet package. These tiny endocrine glands are located toward the tip of the tongue-shaped pancreas as it stretches out toward the spleen on the left side. They make up from one to two percent of the pancreas mass. They have five different cells: Alpha, Beta, Delta, PP, and Epsilon cells. An interesting feature of the Beta cells is their electrical connection with each other but not with other cells. It is the Beta cells that are destroyed in the case of diabetes mellitus (Type 1, or insulin dependent). Let’s talk about the abuse of this precious organ-gland first—and we’ll take up this entire post to have a thorough look at what we might be doing to cripple the pancreas and short-circuit our health. Let’s look at dietary factors first. The culprit is alloxin which was found to quickly destroy the beta cells in the islets of Langerhans without disturbing any other body tissues. When incurable diabetic test animals are needed for experimental use, they are given alloxin to destroy their islets of Langerhans. This begs the question “are we getting alloxan in our foods?” The answer is yes, with definite certainty. Alloxan is formed by the action of oxidizing agents such as chlorine, chlorine oxides, etc. on xanthine, a normal constituent of tissues (muscle, liver, pancreas, thymus, spleen) and of urine, which carries zero to one percent, and of common foods like cereals, malt and yeast, and of meat foods. The artificial sweetener Splenda has a chlorine molecule as a carrier for sucralose. Xanthine is a synergist of vitamin E. It facilitates its function in protecting the genes of the chromosome of the cells from oxidation and enzyme damage. It also seems to facilitate the elimination of excess cholesterol from the liver. Vitamin E is the primary nutrient in wheat germ, and it is destroyed by commercial food-processing practices. Dr. Royal Lee, who founded Standard Process Labs in Palmyra, Wisconsin, did extensive research on Vitamin E and the impact bleaching of wheat flour has had on human health. Here’s just one of his findings dated as far back as 1948, indicating how long we’ve known about the harmful effects of refined carbohydrates, such as bleached white flour, on our health. Since these poison chemicals destroy both the xanthine and the vitamin E of the cereal germ, it is of interest to learn that xanthine can reduce the need for vitamin E in animal feeding tests. (Reported in Nutrition Reviews, Jan. 1948, p. 118.) In fact, we might legitimately consider xanthine as a member of the vitamin E complex. A xanthine compound — theophylline — is used in medicine to relieve heart symptoms of vitamin E and G deficiency. And xanthine is found associated with E and G vitamins in wheat germ. The obvious next question would be “where might we find chlorine and chlorine oxides in our foods?” Well, all municipal water is treated with chlorine to poison the bacteria—and unless you live in Milwaukee where the chlorinated water is filtered through activated carbon to eliminate the chlorine in a 15 million dollar treating plant (thanks to Milwaukee’s breweries, the city’s best water customers, who can’t make beer with chlorinated water as it poisons the yeast) you’re getting daily doses of chlorine if you’re drinking municipal water right out of the tap. Where else? In all white flour products, white bread being the largest consumed white flour product in the American household. How do you think they make whole grain wheat flour white? With bleach made from chlorine dioxide, a patented process non the less. Chlorine dioxide succeeded nitrogen trichloride (AGENE) after its patents ran out and it was conveniently eliminated by the FDA when it was found to cause fatal epileptic reactions in dogs. It, too, functioned as a bleach and bug killer by releasing free chlorine, so it is quite probable that the action of flour bleaches in predisposing humans to diabetes and obesity has been adversely impacting the public health for the past sixty or seventy years since the 1940’s. Glucose (corn syrup) causes low blood sugar as well as diabetes, which leads to a predisposition to heart disease, lassitude, brain fatigue, high blood pressure, overweight, irritability, and mental depression, to list the findings of a 1950 report. This tells us how long we’ve been enabling these “diseases” in America. (They’re not actually “diseases” but simply the symptoms of malfunction in the body caused by abusive dietary practices.) This is criminal behavior on the part of everyone in the food industry from the processors of synthetic sugars on up to the Food and Drug Administration. In dealing with foods, the Food and Drug [FDA] long ago set up the principle that ANY added poison in ANY food was too much. It is regrettable that principle cannot be the guiding force in government instead of commercial expediency — and political expediency. There are other ways of destroying the endocrine function of the pancreas. There is the emotional component, for instance. All of the endocrine glands are controlled and nourished by spirit. They have no direct connection to the controls centers in the brain. Spirit exerts a vibrational influence upon their hormonal secretions. The pancreas is particularly influenced by our emotional climate and expression. It is thought to be the vibrational gateway to and from our emotional realm. What’s going on with us emotionally—the quality of energy flowing through our hearts, in other words—directly impacts the functions of the pancreas—as it does all seven glands— both as a digestive organ and as an endocrine gland. Just as fear shuts down our immune system, negative emotions such as resentment, envy, grief and attitudes of complaint and criticism, held for long periods of time, gradually shut down the endocrine cells in the pancreas. Perhaps it would be more accurate to say that these negative destructive emotions block out the flow of the positive creative spirit of love, which in the pancreas is differentiated as the “Spirit of Blessing.” We’ll spend more time with this aspect in my next post. Suffice it to say that an attitude of blessing and a sweet spirit foster a healthy pancreas. Contrarily, an attitude of cursing and a bitter and complaining spirit foster an unhealthy pancreas, simply by virtue of the fact that they exclude the presence and flow of loving energy. Love nourishes the body. Hate, resentment, envy and grief deprive the body of vibrational nourishment. Without the cohesive vibration of love, the body cells start disintegrating and falling apart from one another. I vividly remember a neighbor years ago, when I was a young man, whose husband passed away. She wasn’t that happy a person even before his death, but afterwards she fell into a slump of grief and depression for a very long time, probably fear as well in her loss of what was likely a more stable and secure life with him around. He ran a shop and she didn’t work, to my knowledge. Within the year of his passing, she developed diabetes and very shortly thereafter passed away. I always felt, even at that early age in my life, that her lengthy grieving led to her undoing. Grief is a natural and essential phase of letting go of a loved one. But one has to let go and stop grieving eventually, or else one’s life essence will be drained away, which I feel happened with this lady. We’ll continue in a more uplifting consideration next post. Until then, be a blessing and change your health . . . and the world. Follow my blog to get automatic email notices from WordPress of new posts. Also, visit my HealingTones.org blog and enjoy the current series of articles “4th Density Apocalypse 2012.” I always enjoy reading comments on my articles and appreciate the time my readers take to send them along in the comment feature. References: Dr. Royal Lee, Vitamin News, Part of the Royal Lee Library Series, Published by The International Foundation for Nutrition and Health. Welcome Bosnia! And Costa Rica! And Poland! And Jersey, beautiful island off the coast of France in the English Channel! Welcome All! August 24, 2012 by Anthony Palombo, D.C.
Well, I got the book, “Genetic Roulette” by Jeffrey M. Smith, and started browsing through it. You do NOT want to read this thoroughly documented book if you do NOT want to know the facts about the health hazards of genetically modified organisms (GMO) in your food. It’s scary. Just what they (Liberty Link) are doing to engineered crops with enzymes that produce herbicide poisons in fruits and vegetables, enzymes whose genes with DNA modifications are NOT necessarily broken down and destroyed in the digestive system and can therefore produce the same herbicide poisons and gut-flora damaging antibiotics in your intestines, is nothing short of criminal. Do NOT get the book from Amazon.com if you’d rather not know the scientific facts and details. I’ll write about some of the most important facts in future blogs . . . which, again, you may not want to read. WE INTERRUPT THIS BLOG TO BRING YOU THIS ASPARTAME ALERT. . .
. . . and I’ll lift it straight from the book. The Sweetener aspartame, (also known as Nutra Sweet, Equal, Spoonful, Canderel, Benevia, and E951) is genetically engineered. The amino acids are grown using GM E. coli bacteria. Although numerous studies and thousands of consumer complaints have linked this controversial sweetener to serious illnesses, it is unclear if the genetic engineering contributes to the problem. The other two sub-units are amino acids (aspartic acid and pheylalanine). These may be harmless when part of protein, but according to physicain H.J. Roberts, author of the medical text, Aspartame Disease: An Ignored Epidemic, in aspartame the amino acids are isolated and in a dangerous configuration (L. stereoisomer). In addition, they interact with free methyl alcohol. These factors make the amino acids particularly harmful. Roberts says the isolated phenylalanine lowers the seizure threshold and triggers psychiatric and behavioral problems, as well as other symptoms and diseases. Neuroscientist John Olney, who founded the field of neuroscience called excitotoxicity, says that aspartic acid is an excitotoxin that stimulates neurons into hyperactivity until they exhaust and die. The FDA compiled a list of 92 symptoms from the more than 10,000 consumer complaints they received about aspartame. These include four kinds of seizures, blindness, memory loss, fatigue, change in heart rate, difficulty breathing, joint, bone, and chest pain, speech impairment, tremors, change in body weight, lumps, blood and lymphatic problems, developmental retardation and problems with pregnancy, anemia, conjunctivitis, male sexual dysfunction, and death. Roberts’ medical text also identifies neurodegenerative disease, cancer, diabetes, obesity, and sudden cardiac death, among others. World Natural Health Organization, www.wnho.net. Aspartame Disease: An Ignored Epidemic by H.J. Roberts,m M.D. Excitotoxins: The Taste That Kills, by Russell Blaylock, M.D. More on GMO foods in later posts. Smith’s book is one for your library. Visit my Healing Tones blog for a series on Pyramid Power. The Great Pyramid of Giza is the current post subject. ALBANIA, ARGENTINA, AUSTRALIA, AUSTRIA, BAHAMAS, BANGLADESH, BARBADOS, BRAZIL, BULGARIA, CANADA, CHILI, COLOMBIA, CROATIA, CZECH REPUBLIC, ECUADOR, EGYPT, FINLAND, FRANCE, GEORGIA, GERMANY, GREECE, HONG KONG, HUNGARY, ICELAND, INDIA, INDONESIA, IRELAND, ISRAEL, ITALY, JAMAICA, JAPAN, KUWAIT, LITHUANIA, MEXICO, MALAYSIA, NETHERLANDS, NEW ZEALAND, NORWAY, PAKISTAN, PERU, PHILLIPPINES, PORTUGAL, PUERTO RICO, ROMANIA, RUSSIAN FEDERATION, SERBIA, SPAIN, SINGAPORE, SLOVAKIA, SLOVENIA, SOUTH AFRICA, SYRIAN ARABIA, REPUBLIC OF (SOUTH) KOREA, SWEDEN, SWITZERLAND, TAIWAN, UNITED REP. OF TANZANIA, THAILAND, TRINIDAD AND TOBAGO, TURKEY, UNITED ARAB EMIRATES, UNITED KINGDOM, USA, VENEZUELA, ZIMBABWE. WELCOME TANZANIA & SERBIA, LITHUANIA and CHILI!! March 17, 2012 by Anthony Palombo, D.C. This former drug sales rep says it better than I ever could. Pharma doesn’t want to cure any disease. It doesn’t dare to. Business is just too good. Listen to what Gwen Olson, a 15-year veteran of the pharmaceutical industry, among the “best of the best” in her field, has to say about the truth of what the drug industry is up to. Visit my Healing Tones blog for inspirational reading on the Significance of the Pineal Gland and other articles relating to the 2012 theme. October 31, 2011 by Anthony Palombo, D.C.
A recent Journal of the American Medical Association study found that vitamin E is not effective in preventing prostate cancer and in fact also raised the possibility that it’s tied to prostate cancer. That report is the latest ding to a dietary-supplement business that saw its industry revenues fall to $350 million in the U.S. last year from $650 million in 2004, according to Nutrition Business Journal estimates. It may well be that the so-called “vitamin E” people are taking is not really Vitamin E and therefore is not functioning as Vitamin E, a powerful antioxidant. But whole Vitamin E is a lot more than an antioxidant. Read on. . . .
Let’s talk about Vitamin E . . . and Vitamin C while we’re at it. The Food and Drug Administration has allowed “ascorbic acid” to be called Vitamin C and for “d alpha tocopherol” to be called Vitamin E. As we can clearly see from the diagrams below, there is a lot more to Vitamin C than “ascorbic acid” and to Vitamin E than “d alpha tocopherol.” These fractions serve as part of the envelope surrounding the delicate essences and co-factors of the nutrient complexes – the very essential ingredients that make the vitamin complex work – protecting them from oxidation. They are all that’s left after commercial food processors get through extracting them from foods with the use of heat and pressure that destroy the rest of the complexes. In the case of Vitamin E, only one of the four antioxidant tocopherols – alpha tocopherol – is left, and the “d” in front of it tell you it’s a synthetic product. They are called “Vitamin C” and “Vitamin E,” but they are no more the whole vitamin complex than an orange peal alone is the whole orange or an egg shell the whole egg. The key word here is “Functional.” Vitamin E functions as a whole component, as does Vitamin C. If you take them apart they don’t function. An analogy would be to take a Swiss watch and smash it with a hammer. You still have a watch, but it won’t function as a time piece. Those of you familiar with muscle testing will understand that when commercial vitamin E was given to a test subject, the arm test was weak. But when a whole-food Vitamin E (Cataplex E by Standard Process Labs.) was given to him, he tested strong. That’s because Cataplex E functioned where the commercial vitamin E did not and could not because it isn’t Vitamin E.
But that’s not the end of the story. It gets worse. Read on. These fractioned components are incomplete and, therefore, seek to complete themselves as whole nutrients when turned loose inside your body, and they will rob from it what they need to complete themselves. For example, ascorbic acid leaches out tyrosinase (cooper), a mineral that is vital to the health of arteries and veins, leaving your blood vascular system susceptible to aneurism and the hormone estrogen without an activating mechanism. Alpha tocopherol (or the synthetic “d alpha tocopherol”) leaches out selenium, another mineral vital to your blood vascular system, leaving your blood arteries unprotected against plaque formation. When you take these fractioned “vitamins” into your body, you are not giving it the vital essences of whole nutrients it needs. For example, the bioflavonoids and the “P” factors that strengthen vessel walls and connective tissues throughout the body, not to mention the cooper you’re not getting and losing when it is leached out. Ascorbic acid has also been shown to scratch the inner lining of the blood vessels if taken in dosages of 500+ mg daily for more than eighteen weeks, contributing to atherosclerosis, plaque build up in the arteries. With alpha tocopherol “Vitamin E” you do not get all the fatty acids essential to heart health nor the natural chelators for your arteries and anti-oxidants to prevent your oils from going rancid. Dr. John Courtney of Standard Process Labs explains it clearly. The body is designed to utilize food in its whole form. If you eat incomplete foods, such as refined tocopherols, all the missing factors are borrowed from the tissue reserves in order to make the partial food usable. Sooner or later, depending on the patient’s past eating habits, there will be a deficiency of those nutrients, causing what’s referred to as a “reversal of symptoms.” This means there is a recurrence of the same symptoms, which were causing the problem in the first place, often to a more serious degree. Bicknell and Prescott, in their book THE VITAMINS IN MEDICINE, talk about bone decalcification and other problems caused by the use of excessive alpha tocopherol. So high potency vitamins are similar to drugs in their effect. They cause a masking of symptoms, which eventually creates additional problems. Dr. Lee [Royal Lee is the founder of SP] used to say that using high potency vitamins was like whipping a tired horse; he would be stimulated to run faster but sooner or later he collapses because you never fed him. Sometimes doctors call us for help with patients with cramps. This could be cramps anywhere in the body-the legs, abdomen, heart, etc. They will say, “I’ve tried everything I could nutritionally, calcium, magnesium, etc., and the patient still has cramps.” Then we ask if the patient is taking high potency vitamin E. Many times they are, and the cramps developed after they started taking the high potency vitamin E. Then, of course, we suggest the doctor take the patient off the high potency vitamin E product. Our approach is to give the patient the specific food factors which he’s lacking, along with the associated factors, which make it work. It is clear that whole food nutrients alone will help you. The others will only hurt your body. Remember, if it isn’t a food it’s a toxin. If you want Vitamins C and E you have to eat whole foods that are grown organically. If you want them in organically whole food supplement form, drop me an email and I will gladly send some to you. Until my next post, take care of your house of being else it evict you. July 26, 2011 by Anthony Palombo, D.C. According to the Food and Drug Administration, that is precisely where you should find them. Because Diamond Foods made truthful claims about the health benefits of consuming walnuts that the FDA didn’t approve, it sent the company a letter declaring, “Your walnut products are drugs” — and “new drugs” at that — and, therefore, “they may not legally be marketed … in the United States without an approved new drug application.” The agency even threatened Diamond with “seizure” if it failed to comply. The FDA’s letter continues: “We have determined that your walnut products are promoted for conditions that cause them to be drugs because these products are intended for use in the prevention, mitigation, and treatment of disease.” Furthermore, the products are also “misbranded” because they “are offered for conditions that are not amenable to self-diagnosis and treatment by individuals who are not medical practitioners; therefore, adequate directions for use cannot be written so that a layperson can use these drugs safely for their intended purposes.” Who knew you had to have directions to eat walnuts? This kind of bureaucratic tyranny sends a strong signal to the food industry not to innovate in a way that informs the public about foods that protect against disease. While consumers increasingly reach for healthier dietary choices, the federal government wants to deny food companies the ability to convey findings from scientific studies about their products. Walnuts aren’t the only food whose health benefits the FDA has tried to suppress. Producers of pomegranate juice and green tea, among others, have felt the bureaucrats’ wrath whenever they have suggested that their products are good for people. Faloon thinks he knows why this is the case. First, by stifling competition from makers of more healthful alternatives, junk food manufacturers, who he says “heavily lobb[y]” the federal government for favorable treatment, will rake in ever greater profits. Second, by making it less likely that Americans will consume healthful foods, big pharmaceutical companies and medical device manufacturers stand to gain by selling more “expensive cardiac drugs, stents, and coronary bypass procedures” to those made ill by their diets. Well, there you have it! Here’s to your health!